What a gorgeous young cat. She's under 3 years old and ready for the loving furrever home she so very much deserves. She's interactive and family oriented, but she'll do best in a home with older, or no kids. She likes other animals but is a little slow to acclimate - so a quieter home is more her speed. She loves her people, and wants to be around you and be petted and recognized, but she's not your lap-cat type of girl. Life on her terms, as is the way with most kitties! (and, she's a STUNNER! ) * Spayed * FIV/FeLV Negative * Dewormed * Microchipped * Vaccinated (You will need to get her up to 2 more before she's 4 months old) $50 adoption fee Please enrich her indoor life with tall cat trees, scratching posts, hidey-holes, window seats, interactive play time with her humans, toys and nutritious food. 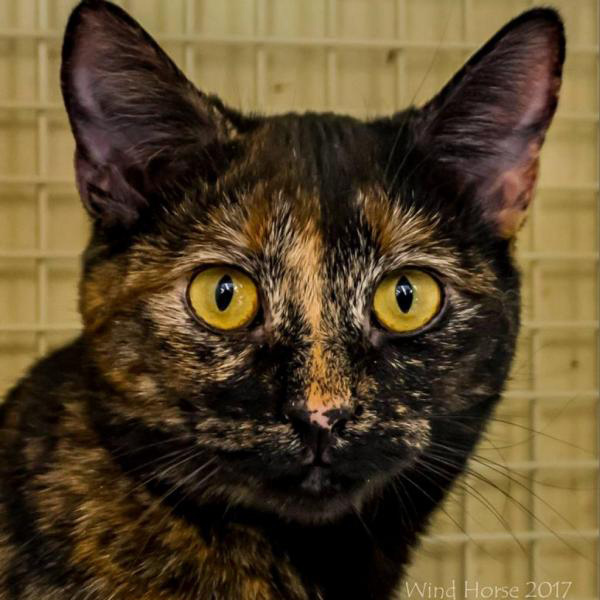 If you're interested in adopting this lovely lady, please click below to fill out our adoption questionnaire.